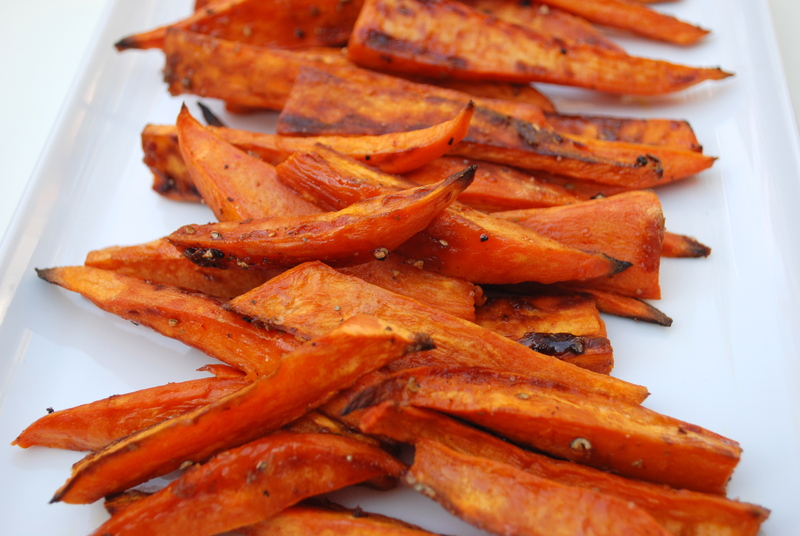 Baked Sweet Potato “Fries” | Time to Cook! This is one of my favorite Ina Garten recipes (and that’s saying a lot!) It’s so versatile – you can serve to kids for a casual, weeknight dinner or with a fancier meal if you are entertaining. You can also make them ahead and reheat them in the oven if you need to. I don’t know about you, but our family can’t get enough of sweet potatoes, so this is a fun way to mix it up. Note: I slice my sweet potatoes a little thinner than Ina and I always double the recipe! Halve the sweet potatoes lengthwise and cut each half into 3 long spears. Place them on a sheet pan and toss with the olive oil. Spread the potatoes in one layer. Combine the brown sugar, salt, and pepper and sprinkle on the potatoes. Bake for 15 minutes and then turn with a spatula. Bake for another 5 to 10 minutes, until lightly browned. Sprinkle lightly with salt (if needed) and serve hot.